In 2005 I was working as a mate to another Saniflo Approved engineer but after a couple of years the requirement broadened and I was appointed as an engineer in my own right for this area. Based in Bishops Stortford, I straddle several counties and most of my work is now in Hertfordshire and parts of Essex and Cambridgshire. I generally have spares for every model on my van and repair all machines on site, usually completing jobs within 24 to 48 hours of booking. Although there are a number of companies/individuals offering Saniflo service and repairs on the Internet, we always recommend that, should the need arise, you utilise the services of a macerator engineer approved by Saniflo Ltd.
Our Saniflo approved engineers will always charge you a fair price and will always favour repair of a Saniflo rather than replacement if this is feasible. Generally, our engineers charge a reasonable set fee for the labour rather than an hourly charge which can extend indefinitely. Extra charges (eg. for difficult to access unit) are the exception not the rule! 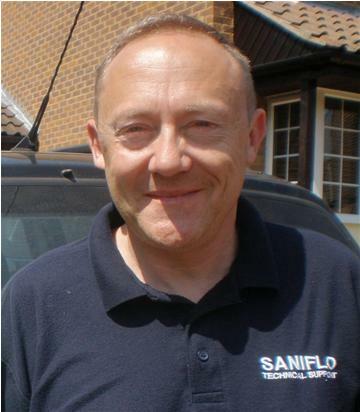 The majority of Saniflo engineers have between 10 and 20 years experience working with the Saniflo range and will have encountered most of the problems that can occur. A policy of continuous product improvement has created many design and component modifications to the 20+ models on our range, and our engineers are experienced in working with these evolving products. Saniflo engineers have regular face to face training on all of our macerator products. Saniflo engineers carry spares for most of our range, including many of the early models. If the engineer does not have the required Saniflo spare part available, this can usually be supplied within 24 hours. Finally, when you use a Saniflo approved engineer you are using an engineer who is trained, supported and backed by Saniflo Ltd and who carries a Saniflo verifiable ID. In addition, only our Saniflo approved engineers are authorized to repair Saniflo units under the terms of our 2 year warranty. IF YOUR SANIFLO IS BLOCKED OR THE EXTERNAL PIPEWORK HAS A BLOCKAGE, TURN OFF THE POWER SUPPLY TO THE UNIT AND CALL THE SERVICE ENGINEER. In such a situation the thermal cutout device in the Saniflo motor will in fact protect it, but to be safe it is better to turn the motor off. This will normally be done at the unswitched fused connector to which the Saniflo is wired. Just pull out the fuse and the power will be cut. When the thermal cutout cycle is operating the machine will alternate between periods of being on and off eg. motor running for a couple of minutes until maximum temperature has been reached, then off for say 20 minutes while the motor cools down, then back on again etc. Pour a strong dose of Saniflo cleanser/descalent or normal household WC disinfectant or bleach (say ½ bottle) into the WC pan. Switch power on, allowing unit to pump out, flush WC. The Saniflo range is constantly evolving and improving....whether it be the cutting blade system made more efficient, motor components fitted by latest robot technology to ensure smoother, quieter running, or by the creation of models operating with brand new systems......and what started out as a range of 1 unit (Saniflo to pump 1 toilet) has now expanded to over 20 models, including a range of Marine pump/macerators running on AC and DC electrical current. To stay on the ball, Saniflo Approved engineers meet regularly with Saniflo technical staff and other engineers for in depth examination of products and shared discussions about the most efficient solutions to problems. Technical information discussed and examined during engineer seminars is pooled and collated by our R and D department where new ideas are tried and endurance tested in our laboratories before being incorporated into the latest production. Opposite you can see one of our test rigs where machines are put through their paces. As well as discussing current products and best practice surrounding them, our engineers are also well placed to learn what new features and benefits customers would appreciate. New products have been developed with the close consultation with the service engineer base who have the field experience to match the laboratory expertise. Opposite our engineers are sitting around the table with the Group Technical Manager discussing new product ideas.